A carbon-fiber subframe can save weight. Canada's Magna International Inc. says it is ready to re-envision the large structural parts it supplies out of carbon fibre, the lightweight composite material that customers have been slow to jump into due to cost sensitivities and limited supply. The Aurora, Ont., parts supplier believes the time has come to jump. "There is capacity in the market today for carbon fibre," Magna Exteriors President Grahame Burrow said. As demand for the material increases, the industry will meet it, he said. And as more carbon-fibre products are made, their cost will become more realistic, and "that value cycle will continue to improve." Magna has been pressing the issue with customers for a few years, as automakers tiptoe to convert to carbon fibre. In March, Magna worked on a project with Ford Motor Co. to produce a large vehicle subframe prototype with 34 per cent mass savings. The supplier replaced 45 steel parts in the subframe with two molded parts and four metallic parts. Magna has a partnership with supplier Zoltek to serve as its source. Zoltek produces a low-cost industrial-grade fibre that makes larger structural parts feasible with "a very good scalability business plan," said Andrew Swikoski, Magna Exteriors global product line director. Zoltek's grade of fibre is not nearly as easy to work with as aerospace-grade fibre, which is in higher demand. But Magna reworks the fibres to reach aerospace-grade properties. While the main motivation for such a subframe is weight reduction for better fuel economy, a switch to carbon fibre also can improve driving dynamics, Magna contends. 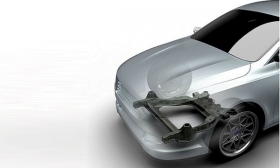 Engineers could redistribute the weight for better vehicle balance. Magna's carbon fibre pitch also contends the process for producing large parts out of carbon fibre has gotten easier. Manufacturing a low-volume carbon fibre part for a race car, for example, might take hours using a traditional autoclave pressure chamber process. Magna says it now can robotically load carbon fibre into a fast-actuating press, mold the material in minutes and robotically unload and assemble it. "The trend is toward more plastic or plastic derivatives in a car and less metals," Burrow said. "That's why we want to stick with the technology, to develop it and bring the cost down by reducing cycle time, and working on different blends of material so it's more affordable," he said. "I think we're getting a lot closer."